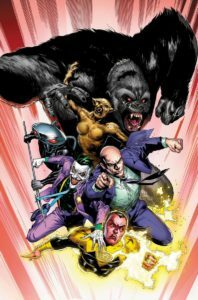 In the pages of Scott Snyder’s Justice League series, the proper Legion of Doom is finally making its way to the primary continuity of DC Comics. Finding its start in 1978’s Challenge of the Super Friends, the Legion of Doom is likely the most iconic and best-known super-villain team that interestingly enough never translated into the comics quite like its animated counterpart until now. Of course, the Legion of Doom was not the first super-villain team to combat the Justice League. The precursor to the Justice League of America in the Justice Society of America faced a team of foes known as the Injustice Society in 1947. Later, some of those villains teamed with Justice League enemies to form the Crime Champions in 1963. Earth-Two’s Wizard, Icicle, and Fiddler aligned with Earth-One’s Felix Faust, Dr. Alchemy, and Chronos to exchange identities and foes to get the better of the other world’s superhero team. This prompted the first team-up between the League and Society to defeat their assembled enemies. But prior to that, the League faced an organized threat from their own cast of rogues.